The College of Engineering at Iowa State University (ISU) partnered with constituents and assessment professionals to identify and validate 14 observable and measurable competencies necessary and sufficient to measure program outcomes. Constituents identified the engineering and experiential workplaces as settings most likely to develop and demonstrate the competencies, and the traditional classroom as least likely. Engineering students in the experiential workplace are assessed on the competencies by their supervisors, providing feedback for curricular change. These results confirm that we must re-examine how we use the classroom to educate engineers and our belief that experiential education is critical to students' success. 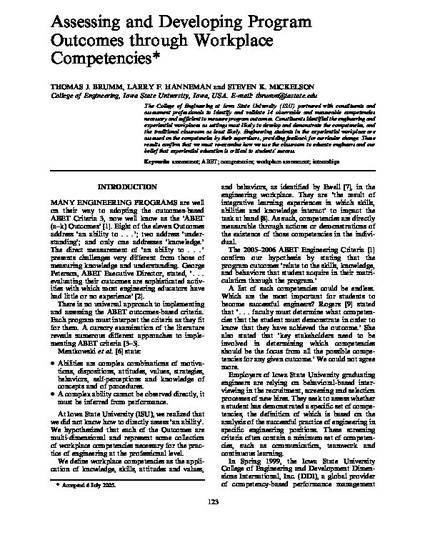 This article is from International Journal of Engineering Education, 22, no. 1 (2006): 123–129. Used by permission.